Just hours after Rep. Ilhan Omar released a statement reporting a surge of threats against her life following a tweeted attack from President Donald Trump, Trump again took aim at the freshman Muslim-American congresswoman on Monday by describing her as House Speaker Nancy Pelosi’s “leader." Representative Ilhan Omar, Democrat of Minnesota, speaks during a press conference calling on Congress to cut funding for US Immigration and Customs Enforcement (ICE) and to defund border detention facilities, outside the US Capitol, Feb. 7, 2019. The back-and-forth coincided with Trump's planned visit to the state Monday to talk about taxes in a district that neighbors Omar's own. The congresswoman commented on the president's visit on Twitter after he announced he was en route. "The Great State of Minnesota, where we don’t only welcome immigrants, we send them to Washington," she said. Omar is a Somali-American refugee. 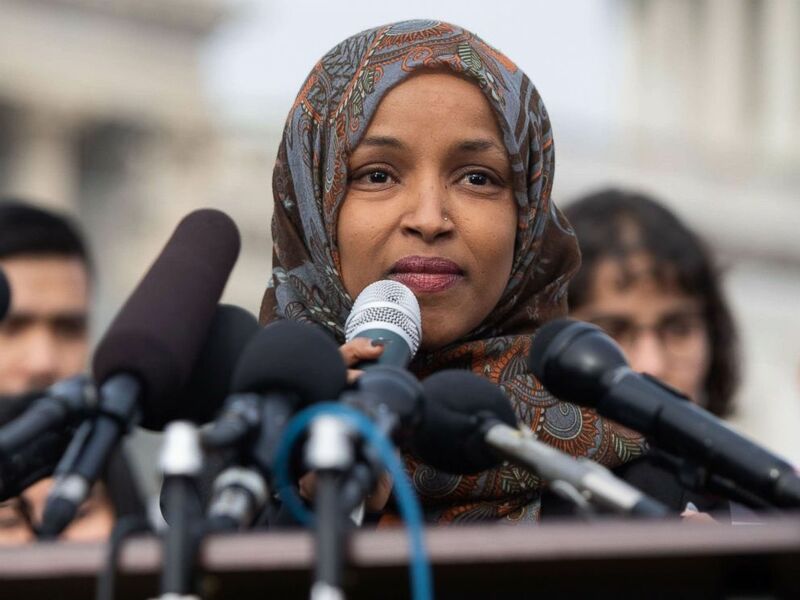 Democrats have rushed to Omar's defense after Trump tweeted out a video Friday evening sequencing a clip of Omar speaking about 9/11 during a CAIR speech last month with disturbing footage from the attacks on the World Trade Center and the Pentagon. Republicans have criticized the seemingly passive reference to the terrorists who carried out the attacks, while Omar's defenders have countered that the remarks were largely taken out of context and have been seized on in order to stoke anti-Islamic sentiment against the Muslim congresswoman. “Since the President’s tweet Friday evening, I have experienced an increase in direct threats on my life—many directly referencing or replying to the President’s video," Omar said in a statement Sunday evening. "I thank the Capitol Police, the FBI, the House Sergeant at Arms, and the Speaker of the House for their attention to these threats." Pelosi confirmed Sunday that she personally spoke with the House Sergeant-at-Arms in order to ensure the safety of Omar, as well as her family and staff. Asked about the president's tweet on Sunday, White House press secretary Sarah Sanders stood by the president's decision to target Omar. Trump visited Burnsville, Minnesota, on Monday – 16 miles south of downtown Minneapolis – to participate in a round table on his new tax legislation at a trucking company base. A crowd of protesters from CAIR, an advocacy group for Muslim-American civil rights, awaited the president's arrival at the company's base. Minnesota is home to a large number of Somali immigrants, many of them Muslim. Nearly one in three Somali-Americans live in the state, according to the U.S. Census Bureau, and between 42,400 and 55,200 people -- about 1 percent of the population of the state -- is of Somali heritage, according to recent census data. The Minneapolis metro-area, in particular, is home to a number of these immigrants and their families. Rep. Karen Bass, the chairwoman of the Congressional Black Caucus, predicted Trump would use the venue to attack the Muslim congresswoman. “We know that he is scheduled to go to Minnesota today, and I imagine that he’s doing that to further whip up irrational outrage over her comments and in our opinion, this only furthers to put her life in danger,” Bass, a Democrat from Califonia, told reporters on a conference call to defend Omar on Monday afternoon. Trump's visit will also garner attention from other groups who will be affected by recent policies, either floated or enacted, by his administration in recent days –particularly those who support efforts in the Twin Cities to align with sanctuary city policies and those who oppose his administration's policy to limit transgender members' service in the military. Both Minneapolis and St. Paul maintain “separation ordinances” in their cities, and though they don't specifically describe themselves as sanctuary cities, the police departments are prevented from asking victims of or witnesses to a crime for their immigration status. Over the past few days, the president has attacked sanctuary cities with a proposed punishment that includes busing immigrants to those cities from the border. Additionally, Minneapolis elected the first two openly transgender representatives to its city council in the 2018 midterm elections. On Friday, the Pentagon's new policy limiting the military service of transgender individuals went into effect, nearly two years after Trump tweeted that he wanted to ban transgender individuals from serving in the U.S. military. Minneapolis city council member Andrea Jenkins took to social media, several days ahead of the president's visit and the day the Pentagon's new policy took effect, to express concern about the administration's policies. "Please America do something, Transgender people are under attack, women are under attack," she wrote on Twitter and on Facebook adding that she is concerned about Omar's safety in the wake of Trump's tweet.